When Willie Torbet retired to Tauranga five years ago after a successful engineering career in Wanganui he just wanted to go fishing. Nothing unusual in that. His only hurdle was finding the right boat. Steve Raea reports. A self-confessed one-eyed cat man – and not of the feline variety – Torbet began his search for a mid-size alloy power cat capable of fast and comfortable cruising. "I was looking for a good all round boat that provided home comforts but not at the expense of a practical layout. Range, performance and sea-keeping were all high priorities." Torbet’s search took him from one end of the country to the other. "It seemed the harder I looked the more I realised just how limited multi-hull production is in New Zealand. There are some are very nice custom-built boats but with price tags to match." 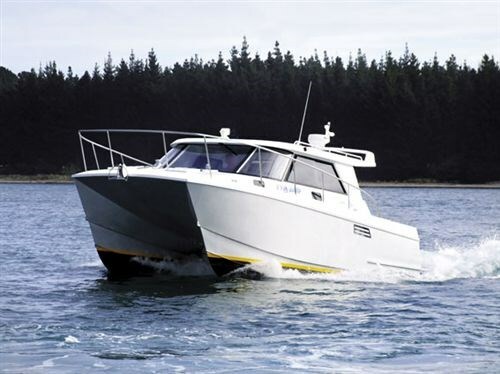 Not to be undone, Torbet decided to build his own boat and commissioned New Zealand designer Roger Hill to interpret his ideas and come up with a concept cat that met his particular needs. Torbet says he wasn’t looking for a second career but that is in effect what he got. With a gas torch in one hand and a set of plans in the other, it would be impolite to now ask how his retirement is working out. With ten completed boats away, two under construction and strong enquiry from as far a field as Fiji and Australia, Torbet has stumbled onto a niche market with the potential for excellent returns. Alloy Cats’ latest offering – 1 too Many – is built on the same hull design as previous boats but features twin FNM inboard diesels and an extended cabin top that adds considerable internal volume. Pitched primarily at the recreational market, 1 too Many benefits from a larger and better appointed saloon and galley. The only noticeable trade-off over previous commercially-orientated designs is a slightly smaller cockpit. Replacing the cat’s traditional twin outboard installation with inboard diesels has allowed Torbet to incorporate a large full length boarding platform. This more than compensates for the loss of cockpit volume and provides a more user-friendly option for dive operators. Torbet’s boats are built almost entirely from 5083 marine-grade aluminium plate on transverse frames and longitudinal stringers. This provides a stiff, ripple-free topsides structure that alleviates any requirement for topside fairing prior to coating. The boats are built upside down on a jig with primary bulkheads mechanically fastened. This prevents movement during construction and ensures tolerances are kept to a minimum. Frames are pre-formed from 5mm plate and machined using CNC cutting technology with extensive cold-cut routing to avoid plate imperfections common with plasma cutting technology. Much of the cat’s alloy superstructure and cockpit is formed by brake press. This reduces the visible impact of weld lines and creates large radius bends in plate work to soften the look of the boat. The one-piece cabin top is moulded from balsa-cored GRP and mechanically fastened to the superstructure. This has allowed Torbet to create an aesthetically pleasing profile while keeping overhead weight to a minimum. The cockpit is self-draining through transom scuppers supplemented with twin automatic bilge pumps fitted to each pontoon. Construction is to MSA standards and at least one boat has been put into charter under safe ship management. Design options to date include a walk-around deck profile, flybridge and short/long cabin top models. Each share the same hull with twin full-length chine rails and double beltings. Torbet says each boat has involved an element of customisation to meet clients’ individual needs. 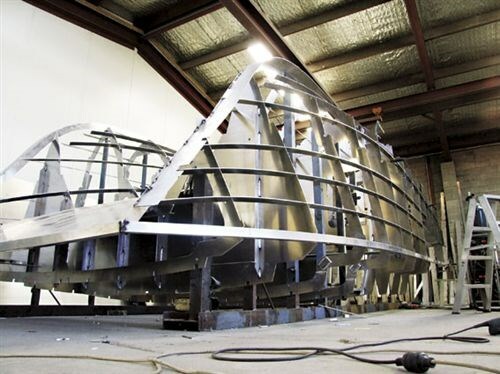 "As custom boatbuilders, we are prepared to adapt our designs and level of finish to suit customer requirements. Our premises are ideally set up to manufacture cats ranging from seven to 12 metres." Cockpit design reflects Torbet’s own thinking of what an all-rounder should be. Wide, deep and clutter free, the cockpit on 1 Too Many will appeal to anglers and divers as much as it will appeal to those looking for a platform for socialising and entertaining. This latest design features twin boarding access from the stern with a large central bait/BBQ station doubling as a gas and storage locker. The bench top is fitted with a stainless steel sink, washdown pump and excellent counter space for filleting, preparing and cooking meals. The brake-pressed box combings provide anglers with a comfortable seat and sure-footing when going forward. A single parcel shelf has been built into each combing. While not long enough to cater for rods they are wide and deep and ideally suited for tackle boxes, gaff, lures and hand lines. They also provide a handy step up onto the combing when disembarking from the side. Cockpit seating for four is courtesy of two very large utility bins built in against the aft saloon bulkhead and positioned under the cabin top overhang. A recessed cockpit shower and downlighting is standard fare. The cockpit sole is plate alloy and incorporates heavy-grade alloy engine hatches that open outwards on substantial hinges. These provide easy access to each engine room and the storage options within. While relatively shallow in height, the under deck cavity goes a long way forward providing useful storage options for bulkier items like fenders, chilly bins, water toys or folding deck furniture. The 230-volts inverter, house and start batteries are mounted in purpose-built cages set in under the combings well off the bilge. The boat’s battery switches are also fixed in the engine room. This means having to lift each access hatch before heading out and again before leaving the boat. Each engine is physically protected by an alloy gate to stop items from fouling engine belts. From a servicing perspective, access to belts, filters and pumps couldn’t be better and, if necessary, the entire engine assembly can be winched out without having to remove any jackets. With an emphasis on indoor/outdoor flow and unrestricted visibility, saloon layout is open plan and simple. Flow from the cockpit is via an extruded bi-fold Seamac aluminium door flanked port and starboard with opening rear windows into the cockpit. The galley is set immediately to port and runs two thirds the length of the saloon. An L-shaped settee is opposite to starboard with a small two-setting saloon table. Crafted from polished timber, the galley features an upright domestic fridge, small Smev two-burner gas hob and shallow Smev stainless steel sink with fold away faucet. Each unit is recessed into the counter top. Again, a small microwave is built into the galley cabinet along with three drawers and a single cupboard. While the appliances are on the small side for a boat of this size the counter space is not, providing space for domestic kitchen appliances and a useful servery. Finished in two-pot white marine enamel the saloon and cabin top is bright and airy with side-opening windows and central overhead deck hatch. Floor coverings colour-match the settee furnishings, adding a homely and stylish touch. 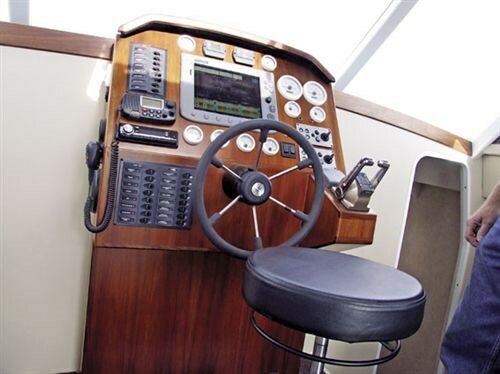 The steering console is located amidships and, like the galley, is crafted from polished solid timber. 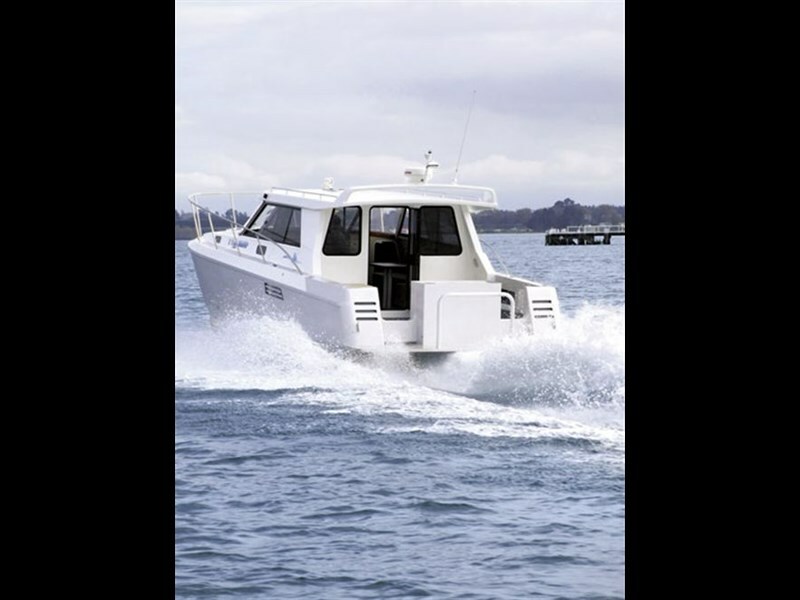 The navigation station is well equipped with a central, 12-inch Raymarine plotter/radar/sounder flanked by a combination of Faria and VDO engine management gauges, VHF radio, chain counter and Jabsco tank monitors. Morse electronic engine controls are well placed alongside the helmsman’s single stool. Access to the forward double cabins and combination head/shower unit is via twin companionways immediately port and starboard of the helmstation. While reasonably wide, the companionways are steep with just two steps down. The shower unit is to port and it’s fully-enclosed and simply appointed with an electric head, small sink and domestic-style shower mixer. An opening topside window provides ventilation. Hot water is by gas califont and shower runoff drains directly to the bilge. There is no cupboard space or facility for storing personal bathroom items. The forward cabins are identical in layout. Each has a large double berth mounted at chest height off the cabin sole. A minimal amount of storage is provided in shallow lockers built into the bunk front. There is nothing in the way of a hanging locker or drawers and no reading lights despite a nicely polished headboard at the forward end of each berth. Lined in cream frontrunner and carpeted on the sole, the cabins can be described as simple but comfortable. A little disappointing is the lack of sitting headroom while in bed. An opening side window and deck hatch provide natural lighting and ventilation. A single quarter berth has been built just off the sole under the starboard settee. In normal trim the cat will sleep two doubles and single. The main saloon settee converts into a reasonable third double by removing the back squab and using it as an infill under the deck head. Because the Alloy Cat has a reasonably large and level foredeck it is the perfect place to throw down a couple of towels or deck chairs while at anchor. With a full length wrap-around safety rail getting to and from the cockpit is safe and secure. Each pontoon is fitted with an anchor hatch providing storage options in each bow. The anchor chain collects in a central well directly beneath the winch – in this case an Italian-made Quest windlass. While not immediately noticeable from within the saloon, the windscreen has a central toughened glass pane and curved acrylic side panes, adding to the cat’s aesthetic appeal. A cat has two primary advantages over a monohull: stability and volume. The boat has both in spades. With a fueled-up weight of about six tonnes, the cat is not light and thus requires some pretty serious horsepower to lift it out of the hole and get it planning at economical speeds. This comes courtesy of twin 225hp Italian five-cylinder FNM diesels bolted directly to Bravo II legs. While lacking the hole shot performance of 250hp outboards, the intercooled-turbo diesels are well matched to the cat. Torbet says the boat breaks out at about 14 knots and taps out at just over 30 knots at wide-open-throttle (4200 rpm). The cat is most economical cruising at 3500rpm. This gives 25 knots across the ground at about two litres a mile, giving a range of 280 miles from twin 300-litre diesel tanks. Torbet says FNM has recently released 250hp diesels that he plans to install into his next built project. While not the quietest in their class, noise intrusion is minimal given that engine insulation has not been used. Both ride and visibility are excellent. The cat responds well to engine trim and the Hy-Drive hydraulic steering is light yet positive. Torbet’s rapid success in the multi-hull market proves his theory that there is untapped potential to be gained through design innovation – even if it means coming out of retirement to realise it.